How much do Bruins suites cost? Prices typically range from $3,500-$8,000 for Boston Bruins Executive suites. Suite prices will vary based opponent, day of the week, and suite level. Suite prices for concerts and other events at the TD Garden can vary widely based on the type of event. 500 Level Suites at the TD Garden typically include going to include 14 - 21 tickets. Guests will receive private entry into the TD Garden. Suite amenities will include a kitchenette, multiple HDTVs, WiFi, fixed seating on the balcony and bar stools inside the suite. Premium in-suite catering options are available to purchase in advance of your event at an additional cost. Executive Suites on the 600 Level at TD Garden typically include 14-21 suite tickets. The 600 Level is stacked directly above the 500 Level. Suites will feature multiple HDTVs, WiFi, a high top table for entertaining and fixed stadium-style seating on the suite balcony. Premium in-suite catering options are available to purchase in advance of your game at an additional cost. Guests will also get private entry into the TD Garden with an Executive suite ticket. 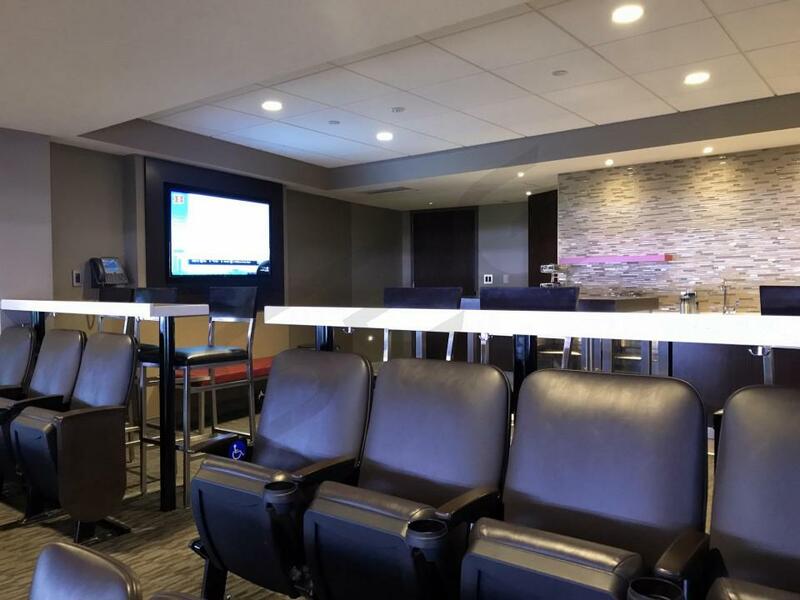 Suite Experience Group is ready to help plan your next corporate or personal event at TD Garden. In this section we’ve compiled the key considerations when planning an event for a sporting event or concert at the Garden. There are a number of sizes and configurations for suites at TD Garden. TD Garden has two main executive suite levels in their Premium Club; 500 Leve Executive Suites and 600 Level Executive Suites. Guests can move freely between the two suite levels using stairs or an elevator and the suite levels are stacked directly on top of one another. Suite-ticket holders will have access to multiple bars and lounge areas on both suite levels. The most common layout for an Executive Suites at TD Garden is 14 fixed stadium-style seats facing the playing surface and 7 high-top barstools behind these seats situated behind a high top table (also facing the playing surface). Most TD Garden suites will come with a base of 14 tickets with the option to purchase up to 7 additional barstool seats for the suite. There is a wide range in suite cost at TD Garden. Bruins and Celtics games typically range from $2,500-$8,000 depending on suite location, opponent, and day of the week. Suite pricing for third party events and concerts will range widely. Suite Experience Group can help you determine which events will fit into your budget. In-suite catering is available in all suites at TD Garden. The menu includes a wide range of food and beverage options provided by Delaware North Catering. 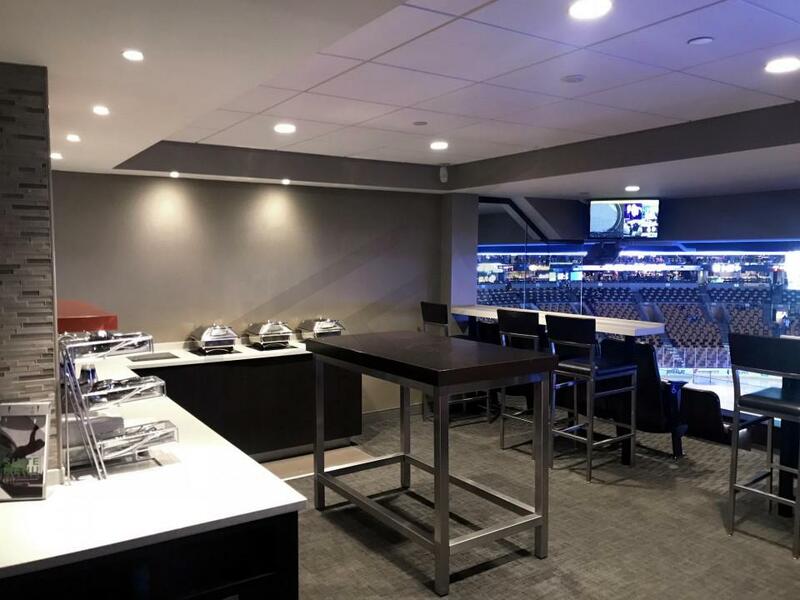 Executive Suites at TD Garden will not include catering in the base price of the suite, so be sure to allocate additional funds if you would like to have your suite catered. The average Suite Experience Group client at TD Garden will spend about $85-$100 per person on food and beverage, however, there is no catering mimumum. Absolute Lounge – This full service bar is located on the 500 Level and contains lounge seating overlooking the playing surface. The Absolute Lounge is accessible to all suite ticket holders. Food and drinks in this club must be purchased. Heineken Green Room Bar – Another full-service bar located on the 500 Level. Drinks available to purchase. Boston Coach Lounge – Located on the 600 Level. Full-service restaurant and lounge area. Suite ticket-holders are able to enter TD Garden 2 hours prior to an event. Suite Experience Group recommends public transportation as there is limited parking available around TD Garden. The Boston Bruins made the playoffs last season and should return again in 2017-18. The Bruins have quickly reloaded with some young talent and are once again among the Eastern Conference elite. Forward Brad Marchand has blossomed from a 4th line role player to a bona fide superstar. Marchand led the Bruins in scoring last season with 85 points in 80 games played. Next season the Bruins will also return David Pastrnak who is fresh off a breakout season in which he scored 34 goals. Center Patrice Bergeron, a perennial All-Star, and perhaps the best two-way player in the league, will return as captain for his 14th season with the Bruins. David Krejci is the Bruins' best playmaker, often leading the team in assists. The Bruins will need better secondary scoring to make a deep playoff run next season. On defense, the Bruins will return Torrey Krug and rookie sensation Charlie McAvoy. McAvoy played his college hockey locally at Boston University and is a fan-favorite in the Boston community. McAvoy burst onto the scene during the playoffs last season and had everyone around the league talking. The TD Garden is one of the most iconic venues in sports and home to the Boston Bruin and Boston Celtics. A Bruins private luxury suite features upscale amenities including HDTVs, comfortable lounge-style seating, and a private bar/kitchenette area. Premium in-suite catering options are available for purchase. Along with your luxury box, you will get private entry to the TD Garden and exclusive access to stadium clubs and lounges. A Bruins suite is the perfect environment for a corporate event or for fun with friends and family. TD Garden will also host J Cole, Earth, Wind & Fire, Shawn Mendes, Ed Sheeran, Roger Waters, Katy Perry and Bruno Mars among others. The Bruins were tantalizingly close to making the playoffs in 2015. They technically tied with Detroit for the last playoff spot with 93 points because of a head-to-head series tiebreaker. Though the Bruins missed out on postseason hockey, they are reloaded and ready to go for 2016. Three of their top four goal-scorers are back and though they did lose Loui Eriksson, this will definitely be a high-scoring team. Left winger Brad Marchand, the team leader in goals scored, returns and fresh off of a career year is expected to play well. Center Patrice Bergeron also returns with his 32 goals scored and 36 assists, good for 68 points and the team lead in 2015. The third highest goal-scorer last season was defenseman David Krejci with 17 goals, but Krejci's true talent was distributing as he also led the team in assists with 46 last year. To compliment the Bruins already talented Group, the team brought in center David Backes and goalie Anton Khudobin. This season the Bruins look primed to win their seventh Stanley Cup trophy. In 2016, the Bruins will host the Toronto Maple Leafs, Montreal Canadiens, Buffalo Sabres, Minnesota Wild, Detroit Red Wings, Pittsburgh Penguins, Philadelphia Flyers and San Jose Sharks. The TD Garden is one of the most exciting venues in sports and home to the Boston Bruins. A Bruins private luxury suite features a private restroom, wet bar, HDTVs, comfortable seating and premium in-suite catering options. Along with your luxury box, you will get private entry to the TD Garden and exclusive access to stadium clubs and lounges. A Bruins suite is the perfect setting for a corporate event or for fun with friends and family. TD Garden will host Adele, the Bad Boy Reunion, Amy Schumer, Blake Shelton, R. Kelly, Sia, Andrea Bocelli, and Shawn Mendes. The Boston Bruins will host the Philadelphia Flyers at the TD Garden to open the 2014-15 season. Along with winning the Atlantic Division, the Bruins were awarded the President’s Trophy in 2013-14 which is given to the team with the most regular season points. With most of the roster coming back for the Bruins this season, Head Coach Claude Julian will have his players eyeing another Stanley Cup opportunity. The Bruins feature some of the NHL’s biggest stars such as Patrice Bergeron, Zdeno Chara and Tuukka Rask. 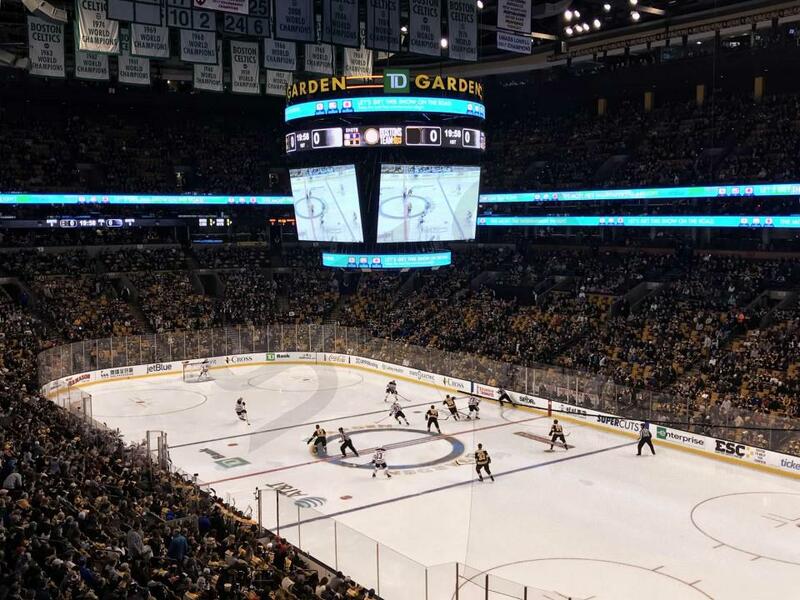 Watch the Boston Bruins from a private luxury suite at TD Garden. A Bruins luxury box features a private restroom, wet bar, HDTVs, comfortable seating and premium in-suite catering options. Along with your suite, you will get private entry to the TD Garden and exclusive access to stadium clubs and lounges. Thank you for signing up for specials at TD Garden. Enter your email address below to stay in touch. We'll sign you up for our newsletter, which will inform you of the latest inventory and events at TD Garden. We promise we will never sell or distribute your information. 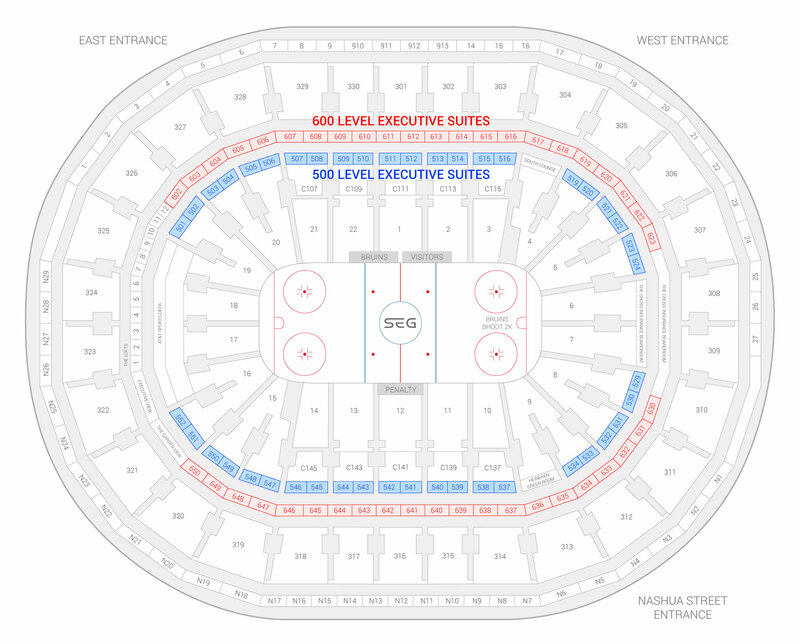 The seating chart below shows where the Boston Bruins suites at TD Garden are located.